Nominee EU Commissioner Peter Mandelson says his colleague Rocco Buttiglione was "unwise" to express his views on homosexuals at an EU committee hearing. The Italian candidate for EU justice commissioner told a panel of MEPs that he thought homosexuality was a "sin". The MEPs decided that Mr Buttiglione, a devout Catholic, was unsuitable for the justice post. 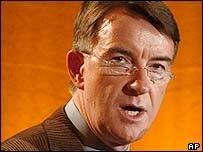 Mr Mandelson said some arguments were best deployed in academic seminars rather than at political gatherings. He stopped short of directly criticising his Italian colleague, insisting it was a matter for the incoming president, Jose Manuel Durao Barroso. In an interview with the BBC, Mr Buttiglione said his views should not prevent him from taking up the job. "I have enough faith to renounce a job in the Commission if need be," he told BBC Radio 4's Today programme. "Now the question is entirely out of my hands, it is in the hands of the European Parliament," he said. European Parliament leaders have failed to agree on the fate of Mr Buttiglione, who also holds conservative views on marriage. Parliament President Josep Borrell said it would simply forward its views to Mr Durao Barroso. Mr Durao Barroso said on Tuesday he had full faith in his new team of 24 commissioners, including Mr Buttiglione. EU law does not allow the European Parliament to accept or reject individual members of the commission - it can only veto an entire team. Mr Durao Barroso is next scheduled to meet parliament leaders on 21 October. The parliament will vote on 27 October to decide whether to accept the new commission. "There is no doubt, I think, it is better for the European Parliament and for Europe to have a man of conscience, but if I should be discriminated (against) because I am a Catholic, I prefer to remain a Catholic," Mr Buttiglione told the BBC. Mr Buttiglione was pressed on whether his views were offensive to many people in the modern world. He said: "I think that many people are sinners, including myself, and I don't think them to be worse sinners than myself. It is a theological issue, and it should not interfere with our policies." Mr Buttiglione, who is close to the Vatican and a member of the Christian Democrat UDC party, said during a confirmation hearing in Brussels that he considered homosexuality "a sin". He went on to say the aim of marriage was "to allow women to have children and to have the protection of a male".